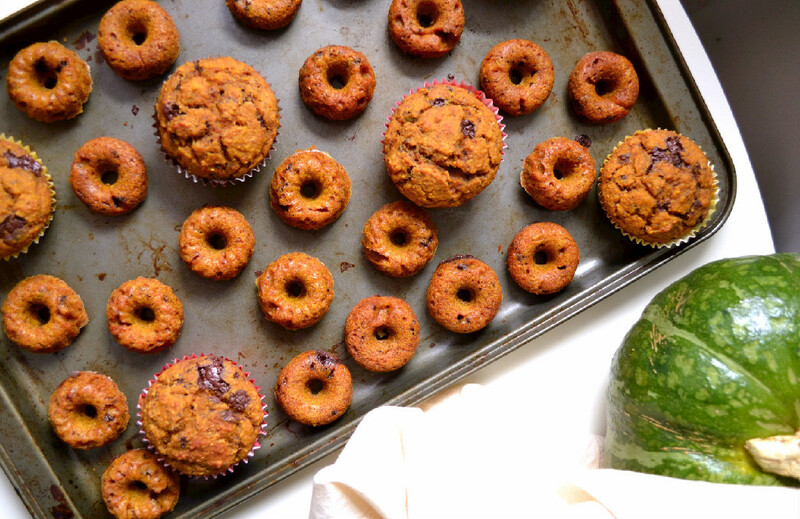 I started experimenting with vegan sugar free baking long before I cut dairy, eggs and refined sugar out of my diet. Something about the copious amounts of refined white flour, white sugar, eggs and butter that went into making a cake or muffin didn’t seem right to me. Nor did it seem right that one would have to give up delicious deserts if they wanted to eat healthier. I first started out by trying to adapt the “classics”, and had a lot of disasters, save a few miraculous results. Then I took to studying the subject of vegan baking, and once I got the hang of things, I started experimenting with my own creations and achieving successful results. Evidence can be found here, here and here and within this very post. 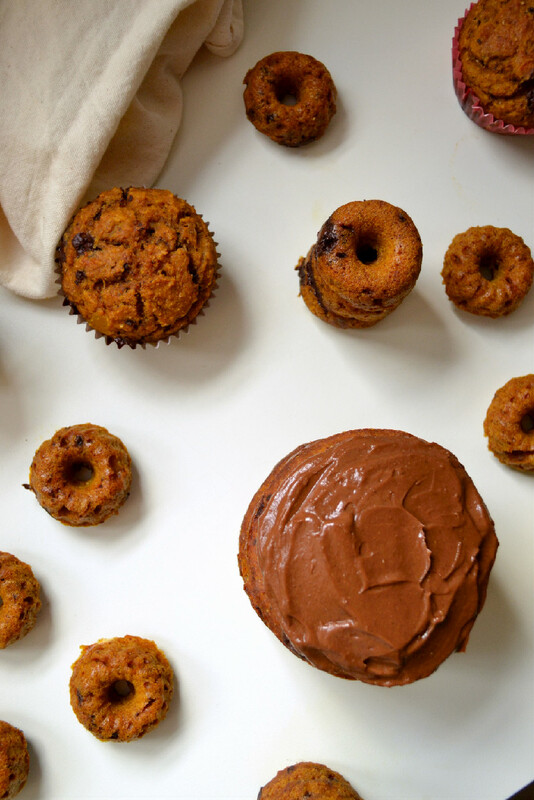 Today’s recipe is an homage to the glorious Kabocha Squash. Autumn’s prized jewel in my humble opinion. It’s deliciously sweet, moist and fluffy and perfect in every way. 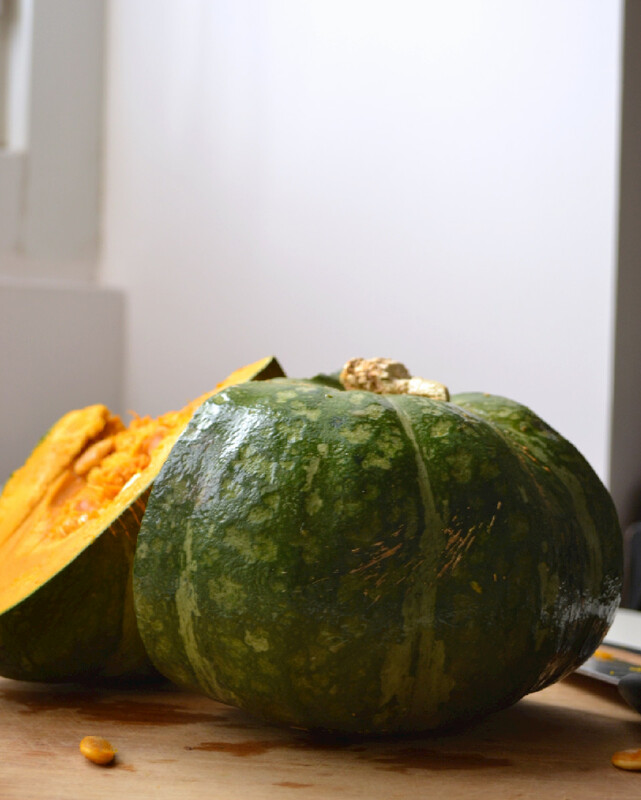 Kabocha, also known as Japanese Pumpkin, is my favourite Autumn vegetable, if not my favourite vegetable overall (dinosaur kale and sweet potatoes are right up there too). It’s extremely versatile, in both savoury and sweet creations and pairs beautifully with dark chocolate and avocado, what more could you want from a vegetable. You’ll likely be seeing a lot of it around here now that the season has kicked in. 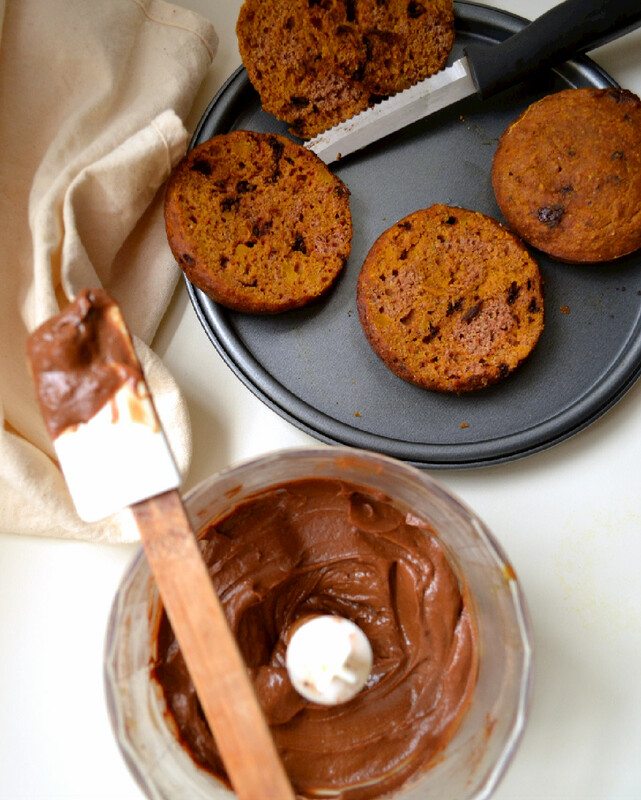 First up is these Kabocha Chocolate Chunk Muffins/Donuts/Cake with an Avocado Cacao Buttercream frosting. I went a little wild and ended up with far too much batter for my 6 tin muffin pan, so as photographic evidence will show, I wound up with 6 muffins, 12 mini donuts, 12 mini bundt cakes and 3 four inch mini cakes, which I stacked to make a mini layer cake. 3 Tbsp Odourless Coconut Oil, melted + more for greasing pans. Peel and cube squash, place in a pot and add about a 1/3 cup of water. You don’t want too much water, just enough to create steam and cook the squash. Cover and simmer for about 20 minutes until water has evaporated and squash is well done and easy to mash with the back of a fork or spoon. You can use an immersion blender or run the cooled squash through the food processor for an extra smooth purée, but I prefer to mash it with my spoon and leave some small chunks. Sift flour into a large bowl. Whisk in baking powder, baking soda, salt, cinnamon, nutmeg, and vanilla powder. In a separate bowl, combine maple syrup, rice milk, apple purée, and coconut oil. Combine wet and dry ingredients from steps 2 and 3 and stir together until you have a smooth and thick batter. Add squash purée and hot water and fold into the batter, until well combined, then fold in chocolate chunks. Bake at 180 C – 20 – 25 minutes for muffins, 10-12 minutes for mini donuts, 15-18 minutes for mini cakes, until toothpick inserted in the center comes out clean. 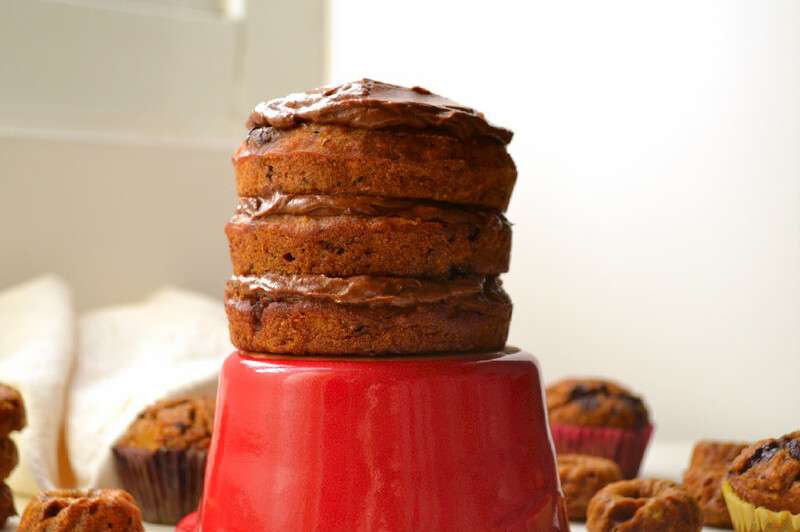 Store muffins, cakes, donuts in the refrigerator in an airtight container for up to 3-4 days. Store avocado buttercream in the refrigerator in an airtight container for up to 2 days. Blend all ingredients together in a food processor until you have a thick and smooth texture, kind of like mousse. 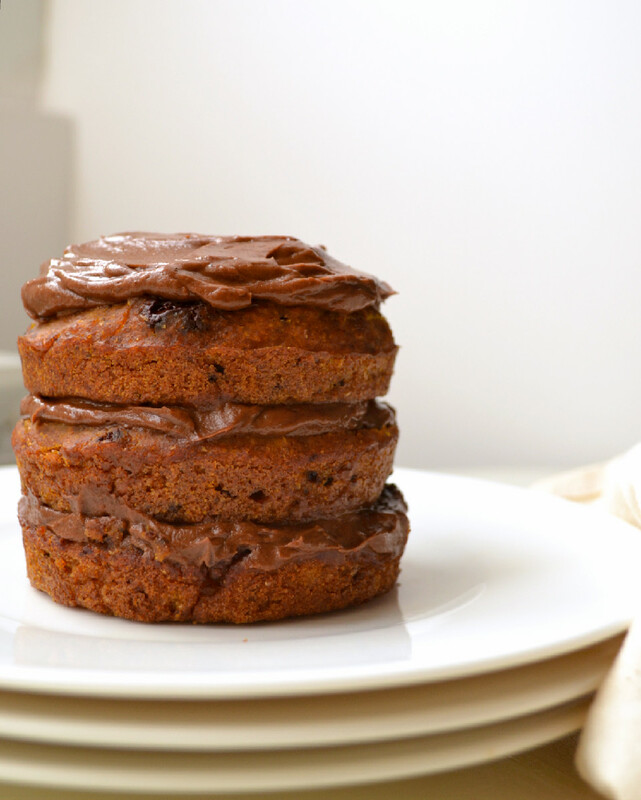 Carefully and evenly slice the tops off two of the mini cakes to get a flat surface, frost each one with two tablespoons of avocado cacao buttercream and place one on top of the other, frosting side up. Place the third and unsliced mini cake on top and frost with the remaining two tablespoons of the buttercream. Thanks Margaux! Don’t be afraid…it takes practice but you’ll get the hang of it. Start with a small one, as its easier to quarter. If you can’t find kabocha try buttercup, but kabocha really rocks so if you can get it, better. I’m the same, once the season starts I have it at almost every meal…I try to vary it up with the variety I’m using and the preparation…soup, roasted, mashed, cubed in a whole grain warm salad, etc….love the stuff that pumpkins and squash are made of!!! Have fun with this and let me know how it works out. Wow! Im definitely going to have to try this…I never would have thought of this combination! Thanks! Would love your feedback if you try it. Thanks so much Audrey. It made for cute photos that’s for sure and a mighty tasty cake of course.